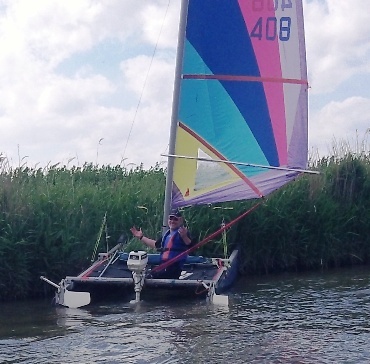 Day Two ---waking to a fresh westerly breeze, and bright sunshine---so a plan to head further down the Waveney to get some good sailing, with a return to Oulton Broad to see traditional boats racing. Above: The Reedham railway swing bridge opens for Nigel. 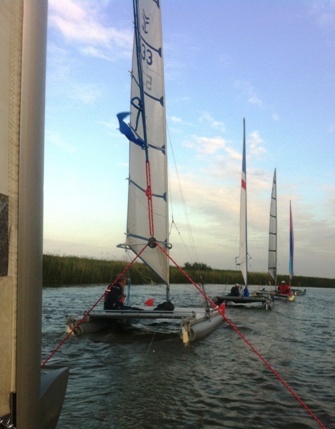 Below: more good sailing, streaming along between the banks in fleet formation, back up the Waveney to Oulton Broad . Below left: Coming out of Oulton, Chris' 3.5 HP engine towing the fleet---even on a good sailing day, a sheltered stretch against the current needed this help.